Visualizing caterpillars boldly waltzing up a wall or playing up a pillow? Would you like to see your vision mocked up, experiment with colorways, or consider a mix of different patterns? I'm happy to do all that for you — just let me know your dream and we can work together to make it a reality. 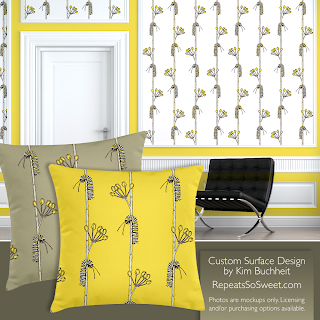 Choose designs from my existing collection of surface designs — or — I can create custom art and patterns just for you!